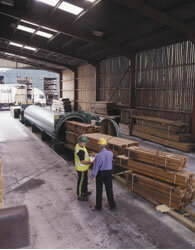 These web pages provide guidance for timber treatment plant operators on how to comply with legal requirements for the industrial treatment of timber. Timber treatment plants are used for impregnating timber with various types of preservatives and/or fire retardants. As the timber is placed in a vessel and impregnated by a preservative under pressure the vessel is classified as an autoclave. There have been three fatalities in the UK since 2008 involving autoclaves and the HSE have produced guidance on Safety requirements for autoclaves. This provides information on the safe operation and maintenance of these devices. It specifically addresses the risks associated with safeguarding, training and maintenance. The safe operation of timber treatment plants depends on having correct design and construction, suitable maintenance procedures, and correctly trained and competent operators. This will ensure that the risks from exposure to the treatment chemicals has been adequately controlled and that the plant is run safely. The Wood Protection Association (WPA), the technical and advisory body for the timber treatment industry, has produced a Timber Treatment Installations Code of Practice for Safe Design and Operation (COP). This has been endorsed by several regulatory authorities including the HSE and Environment Agency. If you adopt the principles set out in the Timber Treatment Installations Code of Practice for Safe Design and Operation (COP) then you should be doing enough to comply with the law. 1. Industrial treatment of timber involving wood preservatives attracts the Control of Pesticides Regulations (COPR) and the Biocidal Products Regulations (BPR). You should only use products approved under these Regulations. For further information see Biocides. 2. Employers should do everything reasonably practicable to ensure their activities are safe and without risks to health. This includes providing and maintaining safe equipment and systems of work, suitable training, instruction, supervision and staff welfare facilities. See HSE’s website ‘Health and safety made simple’ for further information. It is important that employers provide appropriate personal protective equipment, as detailed in the information from the wood preservative supplier i.e. product labels and safety data sheets. It is also important that that good personal hygiene practices are followed. You should have washing and changing facilities within (or very close to) the treatment plant area. These should be designed to prevent the spread of contamination from work wear to personal clothing. prohibit eating, drinking and smoking in the treatment plant area. holding area for treated timber (dripping area). be under an inspection and maintenance regime. See Timber Treatment Installations Code of Practice for Safe Design and Operation for more information on containment. using accelerated drying and fixation techniques to eliminate dripping may also be an option. Health surveillance is not a substitute for preventing or adequately controlling exposure in the first place but it will help you evaluate how effective your control measures are. the results of any biological monitoring tests, skin examination or other health surveillance procedures and the dates they were done. check to see if the actions taken have worked. a liquid which would have a vapour pressure greater than 0.5 bar above atmospheric pressure when in equilibrium with its vapour at either the actual temperature of the liquid or 17.5 degrees Celsius. Note: These are normally solvent-based treatments and do not include the commonly used water based treatment fluids (water has a vapour pressure of only 0.021 bar at 18 degrees Celsius). test date and test pressure. Vessels should be fitted with a safety relief valve set to the design pressure of the vessel as well as a second relief valve to control the working process pressure, preferably set at 10% below the design pressure. Both valve discharges should be directed to a tank. permit the door to be opened only a small amount to release pressure but retain liquid (a catch-lock). See Safety requirements for autoclaves for additional information on safety measures.